Despite not having a garden (just a little forecourt in front of my garage) it was far too nice weather to miss a barbecuing opportunity. So armed with a small disposable barbecue I made these delicious kebabs marrying sweet honey, salty soy and refreshing lemon. These are so easy to make and can be adapted to use different veg. Here I’ve used red onion and pepper but you could quite easily use par boiled root veg, mushrooms or cubed courgettes. Cut the chicken into large bite-sized pieces and add to a bowl along with juice of one of the lemons, soy sauce, honey and a little pepper. Stir and leave to marinate for at least an hour to let the flavours permeate. Chop the red onion in half and then each half in sixths or eighths depending on the size. You want about 3 “layers” of the onion together when you put it on the skewers. Chop the pepper and the other lemon into bite size pieces. When the chicken has marinaded it’s time to make up the kebabs. 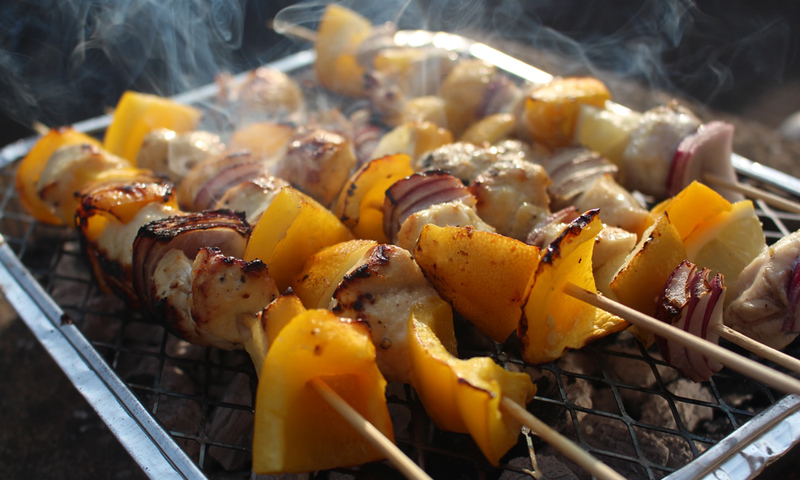 If you are using wooden skewers it’s best if you soak them in water for about an hour before assembling the kebabs so they don’t burn. Add the chicken, lemon pieces pepper and onion to each skewers. Place the lemon and chicken together so the chicken gets and extra hit of the lemon as it cooks. Cook under a grill or on the barbecue turning occasionally until cooked.